It’s never too early to start thinking about next year’s auction! Perhaps you have some things in your basement or attic or shed you’ve been meaning to get rid of. The silent auction is a perfect place for that! Perhaps you are very proud of something you’ve made, or a new recipe that’s blown the socks off of your neighbor. Put it up for the live auction! Whatever it is, we are thankful for your support. And this is one of the ways you can help in addition to attending. 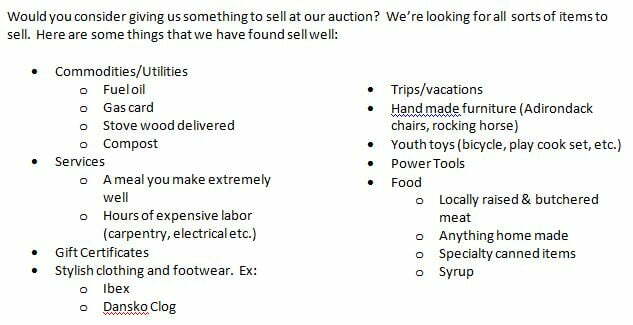 Give worthwhile stuff for us to auction! Please let us know what you have to give by September 9 by mailing/emailing this form back! How much do you estimate the retail value of this item? How did you figure that estimate? How can we get this item?